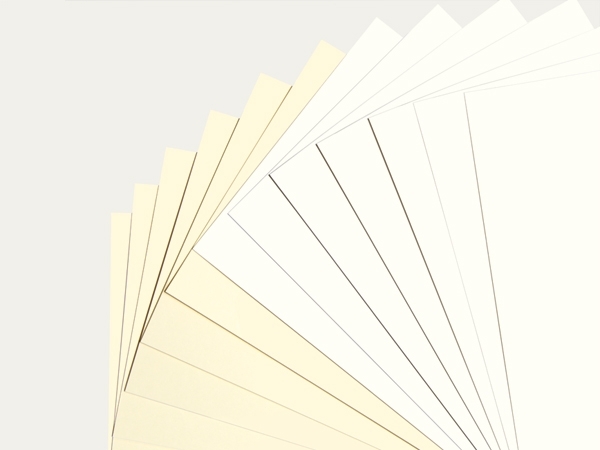 A hard and rigid board available in solid natural white or chamois/natural white in ES-quality, specially suitable for graphic collections. Top surface specially treated thus dirt-resistant, erasable and rub-proof (dry wiping). The board is free of optical brightening agents and has passed the Photographic Activity Test (PAT) in accordance with the ISO 18916 standard. Cuttings: Rough cuts of formats free of charge for more than 1 packaging unit (formats can be divided into halves, thirds, quarters, sixths, eighths or ninths). Other sizes on request. Deviating tolerances are to be agreed upon separately.